My remaining Clivia miniata 2011 blooms. Browsing a White Flower Farm catalog fifteen years ago I saw a plant I wanted: Clivia miniata, or more commonly called either the kaffir or natal lily. The plant’s photograph showed a cluster of eight or more bright orange flowers in an umbel. It was impressive. It was expensive. I asked for it for a Christmas present, but that just didn’t happen. The next year when the fall catalog arrived, I again mentioned how much I wanted one, but decided not to leave it to chance. I bought one for thirty dollars, and then forgot about my order. Coming home from work one day I found a box on my porch from White Flower Farm. Remembering my order, I rushed inside and pulled out the plant. It wasn’t blooming and a bunch of strappy dark green leaves weren’t very inspiring. Still, the catalog had claimed it would be a five-year-old plant of blooming size. I just needed to wait for the flowers. Wonderful! Next day coming home from work, I found another box from the nursery on the porch. Puzzled, I took it indoors and opened it and pulled out two Clivia plants. Unknown to me, some guilty un-gifter had ordered the previous unfulfilled Christmas wish by two. I had eighty dollars worth of Clivia (cheaper when two are purchased); in other words, an embarrassment of riches. At the time I laughed, but now know they were worth the price. Mine grew and bloomed, and continued to grow larger and bloom more magnificently every year. Unlike some blooming plants, their care was easy. 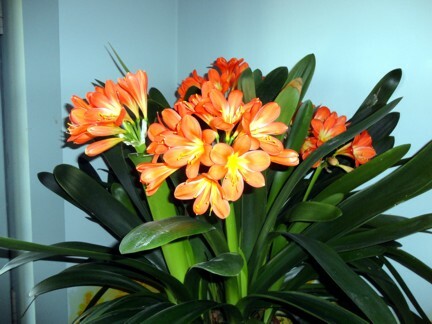 Clivia come from South Africa, growing in damp winter forests. Because our winter is their summer, they bloom in late winter or early spring here, seemingly keeping their own timetable. It’s hard to kill a Clivia. The plants survive overwatering, they survive under watering. They enjoy the summer outdoors in a shady location, and when fall frosts arrive, I put mine indoors in a cool, dark corner. The dark, cold, and a bit of drought bring them into bloom. Usually in late January green flower heads begin to emerge from within the leaves to slowly develop into their orange glory and then last several weeks. They love their roots crowded in their pot and I only transplant mine when the roots literally break the pot — even plastic ones. I fertilize them beginning in August and continue until I bring them indoors. After they bloom they sometimes develop seeds, particularly if a budding botanist child pollinates them. I have raised some from seed and they take five years to reach blooming size. I’m now down to one plant, but it will need dividing and repotting this coming spring. I’ve given away two of the originals and two that I grew, but I won’t be giving more away any time soon as I need to build up my collection. I gave away one for the promise of a yellow cultivar. The trade unhappily never happened. One other thing I forgot to mention. Every so often Clivia will bloom again in August. How great is that?